eastern Oregon is much enlivened by gold discoveries. 'Gold Mines' appears near the heads of the John Days River (east of the new Canyon City); 'Gold Prospects' near the southern headwaters of the Crooked River, 'Gold Mining' down the Owyhee River; 'Gold Mining' at the head of the Malheur River; and 'Gold Mines' adjacent to the Burnt River and the upper Power - where Auburn has now appeared. The term 'Mormon Basin' has been given to a broad area north of the Malheur. In th Grande Ronde Valley 'Gold Mines' appears again. On the Umatilla River is shown, without a name, 'County Seat of Baker County.' Curiously although this map was signed as late as August 24, 1863, no Idaho is recognized.' 'Washington Territory lies east as well as North of the State Boundaries. 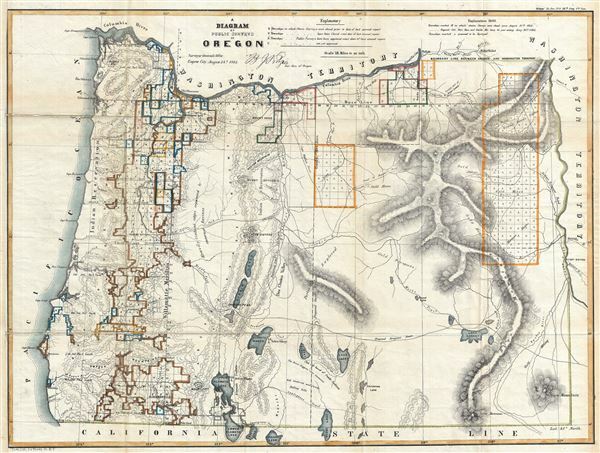 This map was engraved by J. Bien and prepared by B. J. Pengra, Surveyor General of Oregon and issued in the 1864 congressional report, Message of the President of the United States to the Two Houses of Congress at the Commencement of the First Session of the Thirty-Eighth Congress. Rumsey 1077.007. Wheat, Carl Irving, Mapping of the Transmississippi West, 1540-1861, 1088.